On July 18th, 1992, when Sarajevo had already been under siege for three months, a convoy of 46 orphans and minors in disadvantaged situations left from the Bjelave orphanage to be sheltered in Italy. After the conflict, however, they did not return to Bosnia, but were given up for adoption despite some of them having biological parents alive. Among them were brothers Amer and Alen Ljuša, respectively 4 and 6. Thanks to OBCT, they managed to finally get in touch with part of their Bosnian family, namely their cousins Haris and Kenan Hasanagić. This is an interview with Kenan. Why did you decide to look for your cousins Amer and Alen Ljuša after so many years? I knew that my cousins existed, that an operator from the orphanage in Bjelave was in contact with all the children taken to Italy in July 1992 and had also visited them at the Mamma Rita Centre in Monza. But, to be honest, I was not really interested in them – on the one hand because we had seen each other very little in the few years they lived in Bosnia, and then because I was just a 12-year old kid. I knew they existed and that was it. Only when I got married I started to change, I matured, and I started thinking about life, wishing for children – today I have two, aged 4 and 7 – so I started thinking about my cousins as if they were my children and I decided to look for them. In 2009, with the Internet and the birth of social media. I started looking for them on Facebook, in different groups: I found groups of refugees from Sarajevo that had gone to live abroad, groups of former children from the orphanage, and so on. I started writing them, some answered me, some did not. Then Jasenko showed up, he told me that he knew my cousins Amer and Alen because they shared the room at the Mamma Rita Centre. Did he give you information about your cousins? He only told me that Amer's name had been changed to Luca at the time of adoption and that he lived in Lombardy. For me this was very important news, I had finally found a trace. On Facebook he sent me some of their childhood photos taken at the Centre, but then he stopped answering. I did not understand whether he did not remember anything else or he did not feel like talking about it. So I decided to create a Facebook group that I called "Luca Lombardia". I started looking in all the profiles of people named Luca that lived in Lombardy – unfortunately, I did not know his new surname. At one point I was also banned by Facebook, perhaps because they had traced me and considered me as spam or other. All this went on months and months, but with no results. So you let it go? No! I kept looking and I stumbled onto a group of those who were at the Mamma Rita Centre, but it included only those who were already teenagers back then [they were not given up for adoption because they were 12]. They remembered the younger children, including Amer and Alen, but they did not know where they had ended up once adopted. Every now and then some of them would show up and say, "yes I remember them", but nothing more. Jasenko was the only one who gave me information. There were so many Luca in Lombardy... it was an impossible quest. Then I began to reflect on the fact that when they arrived in Italy they were very young and maybe they would not even remember anything of their origins or the names of their relatives. Although I could not find them, I was not worried – I was certain that in Italy they were fine, they had a better life than here in Bosnia. My only wish was to let them know something about Sarajevo, the city where they had not lived much. I wanted to tell them about the death of their father, my mother's brother. I thought it was important for them to know. Do you remember your relationship with them when you were children? Before the war we had not had many contacts with them and their parents. I do not know why, but our families did not meet often. The only thing I know is that this distance was created by the separation between Amer's and Alen's parents. I know I have seen them sometimes, but I do not remember spending time with them, playing with them or anything. Yes, and almost immediately we were displaced from our home in Vogošća, which was 6 kilometres from the centre, as Bosnian Serbs had taken control of the area [last August 30th Jovan Tintor, who was in charge of the crisis command in Vogošća during the war, was sentenced to 11 years for crimes perpetrated on non-Serb civilians], to Vratnik, in the old part of Sarajevo where our common grandmother lived. Their father – my uncle – lived with his mother, and I began to spend a lot of time with him. He was enlisted in defense of the city, and when he came home from the front we went to Sarajevska Pivara [the Brewery , which has its own water source 350 metres deep. During the war it saved thousands of citizens from thirst] with a small cart that we had built, on which we hung two large cans to be filled with water. We began to get to know each other, to get close. My uncle supported the soccer team "Sarajevo", I supported "Željo" [another Sarajevo soccer team, Željezničar] and we would always argue jokingly... for the first time, we were really getting to know each other. Did he ever tell you about his sons Amer and Alen? Yes, he knew that the children had been brought to Italy. But I was a kid and I never asked much or thought much about it, I had other things on my mind. All of us were convinced that they were well, safe, while we in Bosnia were at war and had to think of pure survival. But then on July 28th, 1993 my uncle, who was named Kenan like me, died at the front in the east of Sarajevo. A grenade dropped a metre away from him and he died instantly. I was already 13 but I was very shocked, also because it happened when we had become very close. My brother Haris and I loved to listen to his stories of the period before the war, when he spoke to me of an uncle and then another. Then, even with the war, we children and teenagers tried to live normally, as if we were not under siege – obviously, normal in total abnormality. We went to get water or food, hiding if we heard a grenade drop or running at crossroads to avoid being shot by snipers... In short, we would adapt to the situation. After the war, when did you hear about the children who had been taken to Italy? I remember that a couple of times the media had talked about them and had also published photographs. My mother then decided to go to the Bjelave orphanage to ask for information. When she came back, she told us she had been told that they were still in Italy and that they were fine, nothing else. Only after a while we heard that they had been given up for adoption. Honestly, we were fine with this, since their father was dead and we had not known anything about their mother for years. We also thought that they were better off there than here, where everything was destroyed, there was no work, everything had to start over. So when did you learn anything about it? Only after some time, at the beginning of the 2000s, the television gave the news that there were parents who were looking for their children and asked for them to be taken back to Sarajevo. Among these was Uzeir Kahvić, who was looking for his daughter Sedina. In addition to this series, Andrea Oskari Rossini from Rai produced, in collaboration with OBCT, "Peace orphans ". So I started to follow the case, which appeared several times in the media because over the years the biological parents started to address the Italian and Bosnian authorities [see the first part of the interview with human rights activist Jagoda Savić], but I did not think of looking for my cousins myself. However, after the war ended in 1996 my brother Haris decided to go to Italy, so my mother asked him to try to call the Mamma Rita Centre in Monza to get through to Alen and Amer and know how they were. He did not succeed, they only informed him that they had been adopted. In 2011 Haris, who had continued to search the Internet every now and then for information on the adopted children, came across the article that you published in 2006 on the search for Sedina by her father Uzeir, and under that article he left a comment asking for help to find our two cousins Alen and Amer Ljuša. 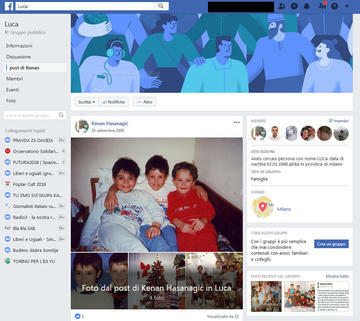 In short, it was one of the many attempts we sometimes made online, also among the former children of the orphanage in Sarajevo, who had perhaps come into contact with those who had ended up in Italy. Then a woman, a certain Vanja, sent me a picture of a child, telling me that she had read about my search and that she was also looking for a child who was only two when he was taken away from Sarajevo with that convoy in 1992. Then she told me she had found two profiles on Facebook and was sure that they were my cousins. I contacted them and they were not. It was a great disappointment, we were all defeated – me, my brother, my wife, and my mother. Especially my mother, she was so happy we had found a way to get in touch with them... but nothing, the void. So Amer, that is Luca, only in 2017 read your brother's comment under the article and called us. After some research, we managed to get in touch with you. Thanks to you we finally found each other after years of searching! The first time Haris called Amer/Luca, his wife Lorenza at the same time was in a video call with me in Sarajevo. So I was able to see my brother Haris speaking with Luca in a video call. It was moving. We asked each other if we were on Facebook, to talk on Messenger... Then, since I speak a little Italian because I have been a seasonal worker in Italy, I started asking Luca "How are you? What are you doing? Look at your face!". I bombarded him with questions as Haris kept telling me "polako, polako! (slowly, slowly)". Then Haris sent him some pictures of his family in Italy, but also of me and our mother, and they agreed that he would go to see Luca, who lived in the province of Milan. I was supposed to leave from Sarajevo to be there too, but unfortunately because of work I had not been able to make it in such a short time. Through Luca we learnt that they had been adopted by two different families, but that Amer had looked for his brother for years and eventually found him. Alen could not make it to the first meeting between Haris and Luca because of family problems, but they had agreed to do it again shortly. Unlike Amer, Alen, who was six in 1992, told us on the phone that he remembered something about his life in Bosnia, and we agreed that we would meet in Sarajevo to talk about it in person. Have you ever heard anything about your aunt, Amer's and Alen's mother? In addition to this series, Andrea Oskari Rossini from Rai produced, in collaboration with OBCT, "Orfani di pace "